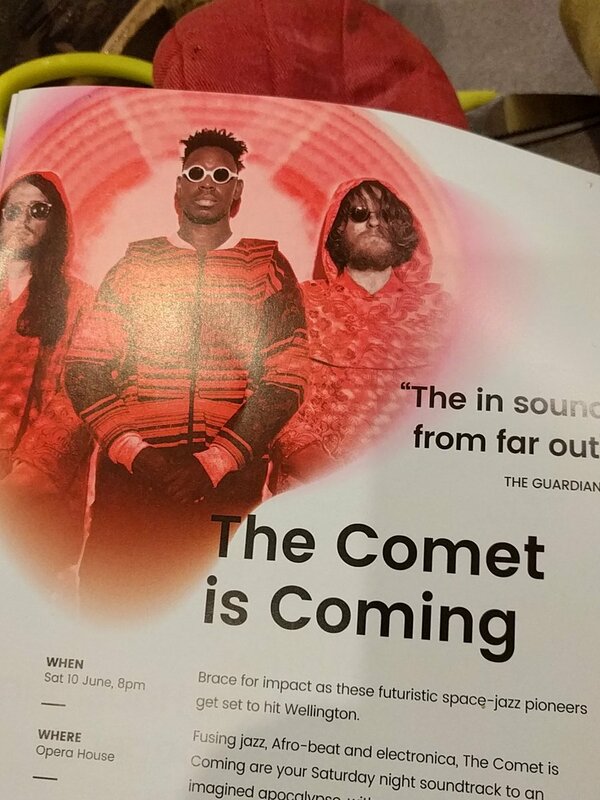 Playing the Wellington Jazz Festival this weekend are the London-based psychedelic funk-meisters The Comet is Coming. They mix sounds from the universe including snippets of Parliament, Sun Ra and Afro-funk pioneers like Fela Kuti – all channelled through a digital dashboard of synths and crazy sax. The imagery associated with the band is based around outer space, science fiction and B-movies, as can be seen in the music videos for their wacky singles Neon Baby and Do the Milky Way. 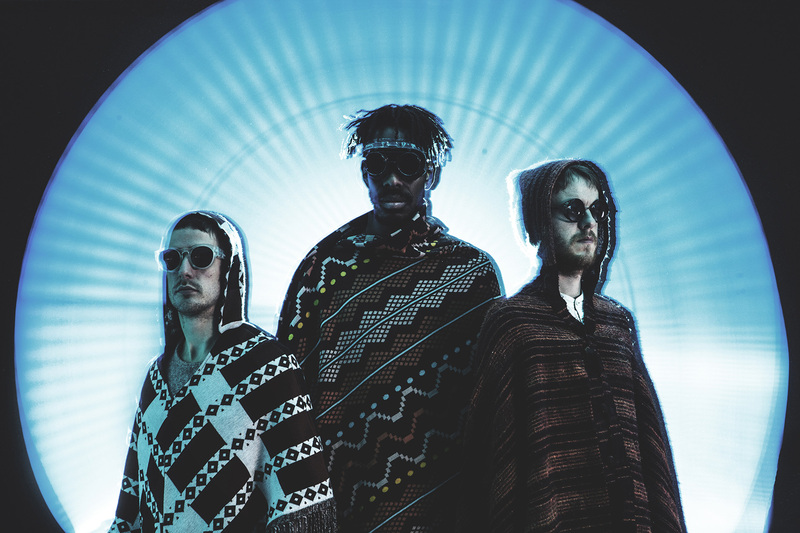 And to add to the mystery the band members go by the pseudonyms King Shabaka, Danalogue the Conquerer and Betamax Killer; who are saxophonist Shabaka Hutchings, synth player Dan Leavers and drummer Max Hallett respectively. The band are currently touring the world, so getting them to sit still long enough for an interview was out of the question. Still, that didn’t stop Tim Gruar from jumping on the keyboard for an email exchange to find out more about their cosmic capers and what to expect this weekend. TG: Where did this crazy thing you call The Comet is Coming all come from? Betamax Killer: Me and Danalogue the Conqueror play as a psychedelic electro synths and live drums duo called Soccer96, he writes. We noticed this tall, shadowy figure hanging at some of our gigs. At one point he turned up by the side of the stage with his sax in hand and when he got up to play with us it created an explosive shockwave of energy that stunned us all. A couple of weeks later he calls me up and says that we should make a record. So, we booked three days and it all came together amazingly fast. We played and recorded with no pre-written material but by the end, we had recorded hours of music. TG: It struck me, watching your video for Neon Baby how far we’ve come with music making. Especially digitally, I notice, Yet the images you use in your vids are snippets from TV Sci-Fi and B Movies (gotta love the Space 1999 and Battlestar Galactica cuts). Was that the vision of the future you had when you were growing up? Betamax Killer: When I grew up, I was allowed to stay up late Friday night to watch Red Dwarf on TV. It was totally out of control story plots that were impossible to predict. At the same time, it was incredibly stupid humour. Later when I was at University we didn’t have a TV licence but a friend of mine had all the Red Dwarf episodes on VHS. And so, it was pretty much the only thing I could watch for a whole year. I don’t know if you had that show in New Zealand actually. TG: Actually, we did. And its late-night screening time was responsible for me sleeping in at least on 3 occasions, maybe more. Because Betamax asks if we had red dwarf here in Nz and I’m saying ‘yes’. TG: What guided your thinking, to model the sound and the visuals on this retro space theme vibe? Betamax Killer: I’ve always enjoyed the creative freedom applied when imagining the future. We get to completely redesign anything we want about the world and see what happens. Old sci-fi appeals to me as it pulls you back into the past and whilst launching you ahead into the future at the same time. Everything feels strange but also familiar. I think this is also reflected in our writing and production. We record using tape machines and old mics and old instruments but also attempt to travel into the unfamiliar. TG: Your sound has that retro-future theme to it. Who were your early influences? I’m hearing Sun Ra Archestra, Manu Di Bango, Afrika Bambataa, Parliament, George Clinton and Funkadelic. Would I be right? Betamax Killer: Personally I definitely had big George Clinton phase. I used to drum along with some of those albums, trying to get deep with the pocket, but also soak up the positive mushroomy vibes. He always seems to have a divine insight that feels enlightened and it’s very infectious. I always felt you are listening to a man who has done enough drugs to see through everything, and he’s letting me know that it’s basically all good if you stay funky. I think this is a very important lesson both in life and in music. To create positive intention and an honest musicality to bring all earthlings together. TG: The band make their music in a small studio with the best name ever. Tell me about the ‘Total Refreshment Centre’ studio recordings that spawned Neon Baby? I think I can hear bottles clinking and people talking and dancing in the background – was this recorded live like a nightclub? Danalogue the Conquerer: The Total Refreshment Centre is a very special place in Dalston, London. It is an old Victorian warehouse that has been re-purposed as a live music space, along with a brilliant recording studio, co-run by Danalogue along with legendary electronic artist Capitol K.
The original sessions that spawned tracks from our Prophecy EP (2015) – including Neon Baby – and tracks from the LP Channel The Spirits (2016) were based largely on improvisation, played completely live, to tape, with the tape machine inside the room with us, engineered on the fly. Whilst the daytime sessions had yielded plenty of fruit, we had an inclination that a night session with people in the room, beers and good vibes might give an extra angle to our output and an extra energy. Neon Baby is one of the few tracks from that session, and there are indeed bottles clinking and percussion being played off mic, which occasionally pops through. Watch the video (see below) to a neon baby and you will see short exerts filmed in the moment! TG: In fact, I have seen one of their videos of a recording session and was blown away by how ‘simple’ they’re set up is – yet how complex the sound is by comparison. What equipment are you using to make all that sound?, I ask. Danalogue the Conquerer: The band is essentially comprised of a drum kit, a saxophone, and two synthesisers, both analogue, both Roland, one Mono, one Stereo. It is pretty simple, and I’d argue that you can get bands with far more members and instruments that don’t sound anywhere near as huge sounding. On record, we use a drum machine to stay in time which is sometimes added in the mix, but I guess part of why it sounds like a lot of sounds is that we are often playing with a degree of intensity that fleshes it out. TG: No band likes to talk about their writing process. How does it get started – because when I hear your music it’s like divided equally into 3 parts and I can’t tell which parts lead and the rest are following. Normally, in jazz, you have melody and a downbeat that directs the tune. The soloists play over the top and grab the glory by in Comet it feels more democratic. Danalogue the Conquerer: I don’t think we started out to make a jazz record, so in that sense, our writing process has nothing to do with jazz. 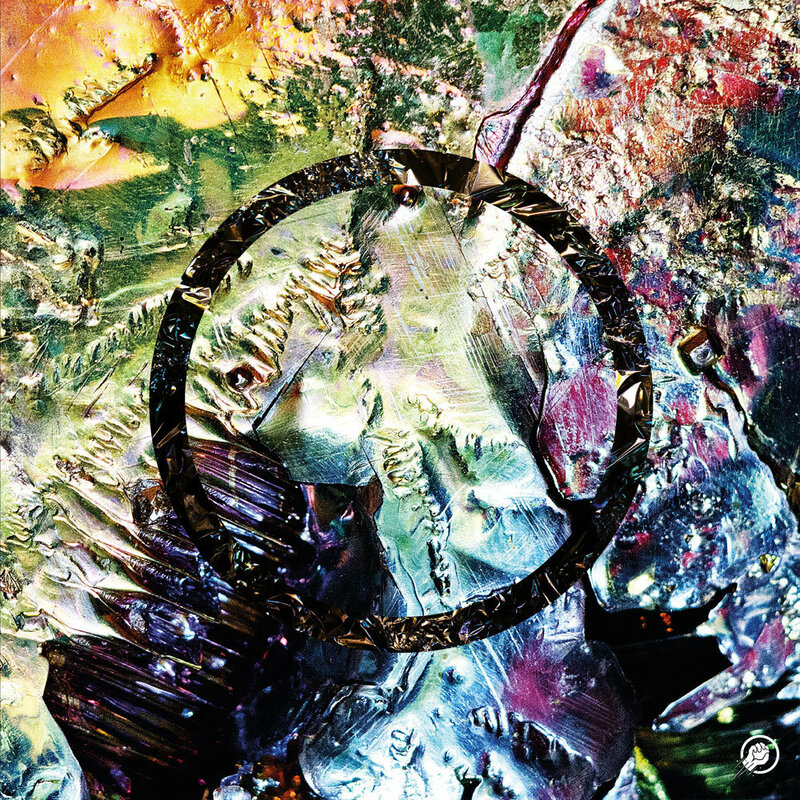 Betamax And I already had a writing and recording style from playing as Soccer96, and involved improvising onto tape in a recording studio, so when Shabaka joined us we were ready to roll. We also ran Shabaka through a giant guitar amp owned by Capitol K which took the saxophone to an electric guitar kind of place and set a new, dirtier vibe particular to our group. In terms of composition, Herbie Hancock said once that improvisation is composition, just in a very fast form, you compose at the moment, minute to minute, make your choices in a split second, and if you all listen together and play with synergy and cooperation, you can even form structures, dynamics and arrangements at the moment. It takes a very special group of players to pull that off, and I knew in the first minute of the first recording session that what we had as a group dynamic was going to be explosive! TG: From what I’ve read, this group came together when King Shabaka joined in from the sidelines. I ask Wasn’t this originally a two-piece called Soccer69? Can you explain the origins of the group? King Shabaka: I liked the music of Soccer 96 so I asked to sit in on their set a few times. We decided after a while to book a studio and record some jams. We found structures out of hours of free improvisation and built an album from it. Then started to perform at parties, then festivals. TG: Can you tell me about your sax (and clarinet) playing. How did you develop this sound? Why not, for example, play like Bird or in a more traditional way? What spirits guided you in this direction? Have you got formal training or did you learn from the street or a club? I keep reading about Sons of Kemet and your group’s associations. King Shabaka: I trained classically at the Guildhall school of music on the clarinet predominantly. I’ve developed a way of playing that incorporates aspects of many types of music that I like outside of the parameters which usually typify genre-specific playing. I’ve been through many phases of assimilating various styles so at a point in my career I was playing more orthodox jazz, at a point, I was more into free improvisation. At this time, I’m into how I sound now which feels like an amalgamation of lessons learnt from these and more styles. I’ve always enjoyed jamming and performance in clubs so outside my classical training I learnt jazz by trial and error in clubs and bars, and through studying books and albums. Currently, the ‘Comet’ has just landed at a jazz festival in The Netherlands. King Shabaka: Generally, if the gigs are marketed to people who are up for a rave and are open to joining us in the energy then it’ll be an epic show regardless of geographical placement. Sometimes we’ll turn up to a small town somewhere and there just won’t be that (type of) demographic, though, so we feed of vibe that the crowd is giving regardless and as long as it’s an honest exchange on both sides I think there is potential for a great performance. (When you come to our gigs you have to) feel free to express yourself with integrity. In other words: Party hard! The Comet Is Coming play the Wellington Jazz Festival Saturday 10 June. This entry was posted in Music Review, Uncategorized and tagged The Comet Is Coming – The 13th Floor Interview; Wellington Jazz Festival by timgruar. Bookmark the permalink.